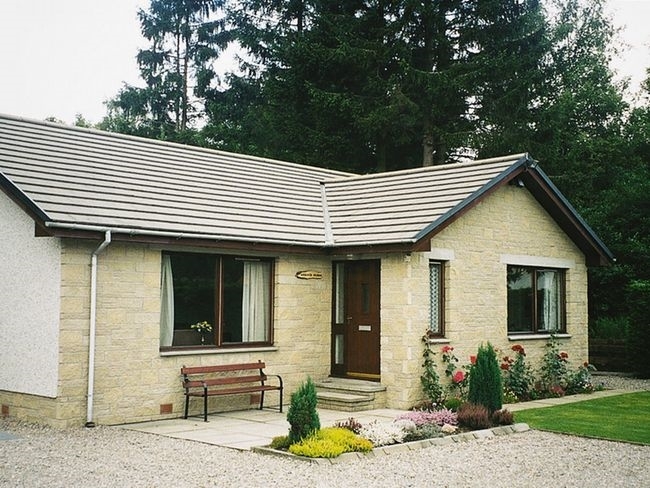 A spacious detached house located in the village of Newtonmore, amidst wonderful mountain scenery making this the perfect base for an active Highland holiday. Hill-walking, climbing, horse-riding and mountain biking are popular ways to explore the countryside, or take "The Wildcat Trail", a waymarked path encircling the village and providing stunning views of the Cairngorms and Monadhliath mountains. Some of Scotland’s rarest wildlife species thrive in this peaceful area and you may see golden eagles, osprey and red deer. Step back in time to experience life in the 18th century at the fascinating Highland Folk Museum. There is something to entertain all the family here. The accommodation offers THREE bedrooms: 2 doubles (both with w.h.b) , 1 twin with walk-in with shower. Bathroom: with separate shower. Lounge: with TV / DVD. Kitchen/diner: TV, cooker, microwave, fridge/freezer and washing machine. Outside: enclosed garden. Amenities: bed linen and towels included. Electric by meter. Location: shops, hotels within walking distance. Arrival: 4pm.